Beauty columnist Bianca Valerio lets you in on the latest remedy for your man's thinning hair. As young girls, we all wanted to meet our knight in shining armor, but let's not confuse the shine of armor with that of a severely receding hairline! October may be Breast Cancer Awareness month for gals, but that's not to say men must suffer in silence from their own genetic predisposition: balding! Some guys may solve this problem by getting a Donald Trump-style combover or simply shaving it all off a la Bruce Willis, but they shouldn't feel limited by these polar opposite options. In fact, if we women can rely on mascara and false lashes to volumize sparse hair on a whim, men also have an ever-ready answer to their predicament. If this is something your man is concerned about, make him try Crowning Glory Advanced Hair Fibers (P990), which provides an instant remedy for hair loss. Prominent personalities like Ben Affleck have been suspected of covering up with this type of product. Even women who have thinning hair can benefit from it! It works by applying natural, microscopic hair fibers that are charged with static electricity to bind naturally to existing hair. The result is dramatic density, fuller volume, and natural-looking locks. 1. Style thinning hair as you would normally, but without any products like hairspray, gel, etc. 2. Once the style is set, sprinkle the fibers onto hair. Remember, less is more. 3. Just using you hands, carefully spread the fibers to cover balding areas equally. If he'll be going outdoors or facing harsh weather, he can keep the fibers in place by spritzing on Crowning Glory Hair Mist for extra hold. 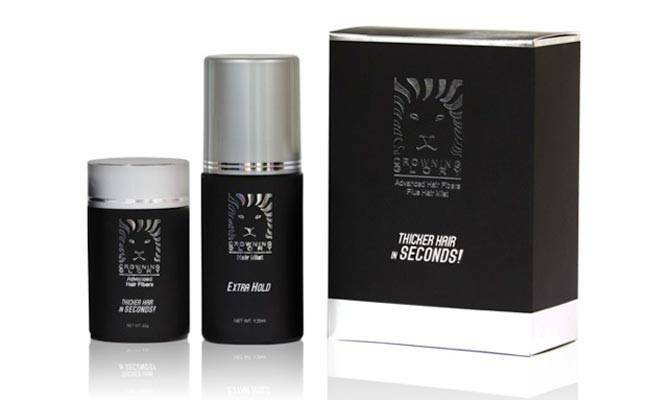 There's no reason for your guy to feel insecure about his thinning hair now, with a miracle product like this on the market! Check out this before and after video to see the results! Crowning Glory products are available locally at leading department stores, dermatologists, and partner salons. For more information, call 637-5181, 633-6165, or 638-4234.